A couple of years ago I was lucky enough to be in London, where I visited Blaze to check out their signature product: the LaserLight. Other than holding the light in my hands and seeing how good the image looks on carpets on cubicle walls, I didn’t get to spend much time with it. But now I finally have one so I’ll be able to give you a more thorough review (Full disclosure: I write a regular series of cycling articles for Blaze's Blog but my initial impressions of the LaserLight were written long before this relationship began - and I am not being paid to write this post). While I’m now in the position to write about the LaserLight in a non-abstract way, I can confirm that my initial impressions were correct: it’s a sweet light. The design of this thing wasn’t phoned in: it has heft due to its construction (Blaze has geekalicious video clips of how it's made on their site) but it just made me confident it would be hard to break. The light comes with a special, bright green charging cable with magnets that attach to the charging area on the top of the light. It’s made that way to help it stay water resistant. The only downside is if you lose or damage the hard-to-lose bright green cable you have to order a replacement. Also, since the magnets don’t click into a recessed space on the light (like a MacBook does) the cable can get bumped out of place if you charge it on a cluttered workbench. The bracket that attaches the LaserLight to your handlebar exudes confidence - especially when you measure it against lesser brackets (an extra Blaze bracket can also be ordered separately if you have multiple bikes). When it is on the handlebars it doesn’t feel like it will ever come off - and that’s important. A quick rummage of the 304 reminded me that I’ve found quite a few bike lights in the road. From left to right: a taillight I found in Darien, Connecticut, another I found in Redwood City, California and a bike headlight - that looks like E.T.’s severed head - I found in Strasbourg, France. I use the latter two frequently. I also have a functional taillight I found in New Canaan years ago I still use on my Bike Friday. That’s why the bracket is an unsung innovation: your bike light won’t work effectively if it falls off your bike. As cool as the bike light is, we have to remember it - and a lot of bike lights for that matter - aren’t made for the cyclist. They’re made for the people the cyclist comes into contact with on the road. Many of these people are rushed, clumsy, angry, tired, distracted, have dirty headlamps, haven’t replaced their windshield wipers since Nixon was in office, and drive vehicles that can kill us. To illustrate that point I put my LaserLight on a clamp attached to one of my speaker stands - tied with my City Bike and my hospital room table as the best $5 I’ve ever spent at a tag sale - and set it at the same height as my handlebars. Mindful of the time I was shooed away by the Stamford police when trying to test bike lights in real world conditions, I wanted to be quick when I hustled out onto a street in San Jose. I first set the stand about five feet behind my parallel-parked car, turned on just the LED light, and got behind the wheel so I could look in the rearview mirror. Now that isn’t too bad but imagine what it would look like on a busy street with a lot more lights. And admit it: when you un-parallel park, you give the mirror a fleeting glance before you look out the windshield and drive off. 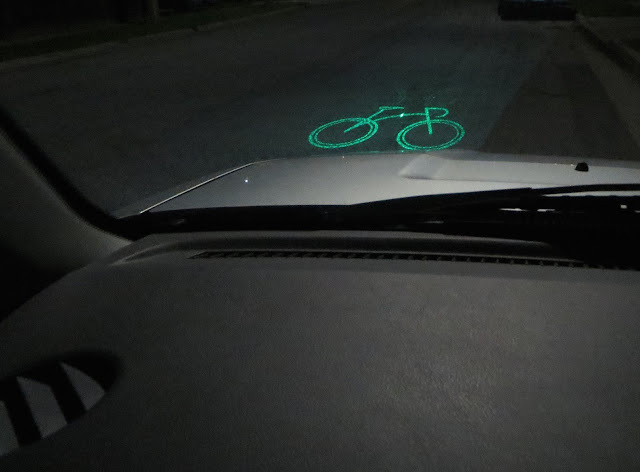 But that’s where center-stage feature of the LaserLight comes in: when it is on, this is what the driver will see out the windshield - and that’s if it doesn’t catch their eye as it zips by the side window. This bike light - when used in conjunction with responsible riding - raises the odds you’ll die of old age. Not only that, but because it is such a conversation piece (sometimes, with motorists who roll down their window to speak with you at red lights) it raises the profile of cycling. 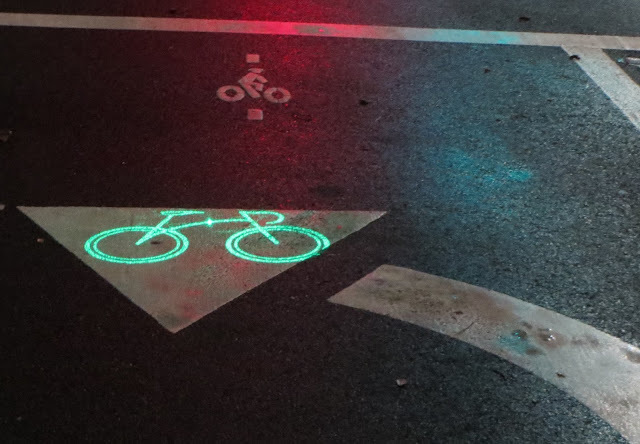 When I’m passing several pedestrians and hear one of them exclaim “Look at that bike light!” I think that maybe, just maybe, a conversation about driving less and biking more takes place long after I’ve pedaled out of earshot. Visit Blaze.cc or ask your local bike shop to buy one. It's north of $125 most places - but I've met the people who designed the thing: they're worth it and so is the light. Thanks for reading and thanks for riding.